Today’s post by Sherrilee was first published in 2010. Most of my growing up years were spent in a big city in the Midwest, where the wildlife consisted mostly of squirrels and sparrows. So it was a big deal when we vacationed every summer in the northern part of Wisconsin at the family homestead. We saw deer from the car windows and even the occasional black bear at the town dump. 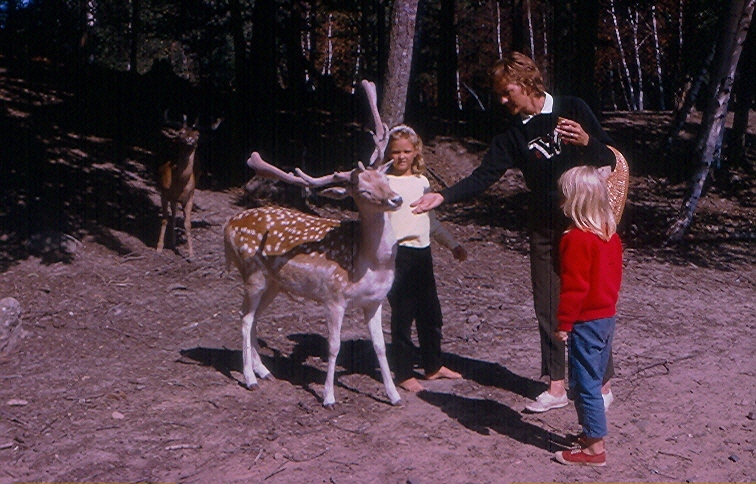 When I was seven, an animal park opened up in St. Croix Falls, which was along the route my family always drove to get to Wisconsin. Fawn Doe Rosa was (and still is) a place where you can feed and pet a variety of animals, from deer to ponies to geese and ducks. Always looking for a way to break up the long drive to and from up north, I’m sure my parents were delighted to find anything to get us girls out of the car and out of their hair for awhile. That first year, when I was seven, my sister and I wandered all over the park. Except for dogs and cats, I had never had any interaction with an animal before and was a little leery of the deer, some of whom were bigger than I was. So I opted for the smaller and safer geese and ducks that abounded at the park. At one point, as I was feeding some geese along the little pond, a young elk spotted me. Clearly understanding that I was the repository of food, he headed right for me, although I didn’t notice him, so intent was I on my task. My father, who was capturing our day with the camera, snapped a shot as the elk approached me, but didn’t feel the need to warn me. Of course, even though the elk was quite small (as elk go), he did scare me out of my wits and I stepped into the pond and got my feet wet. It took my mother several minutes to get me to approach the poor elk, who was probably as scared by my antics as I was by his, but was willing to forgive me for my outburst, since I still had food. Within a little bit, I was petting him and feeding him, like he was no more different than the family dog. I think about this day often, as the teenager and I still visit Fawn Doe Rosa at least once a summer. What would have been a scarring experience that scared me off animals for a lifetime, turned out to be the beginning of a lifelong love of creatures great and small. We trek out to our two zoos here several times a year, love the Wolf Center in Ely, visit any animal park we find along the way and I believe my love of animals may have rubbed off; the teenager has expressed an interest for a career with animals, although it’s still a little too early to tell. What memorable childhood experience was captured on film? I do remember this one. vs picture was implanted in my brain in addition to hers. I had a grandfather with a movie camera and an uncle with a poloroid but the family photo album was a little bare. most of my memories are just that. vivid pictures of cousins from Fargo in various Detroit lakes cabins we shared with 10 boys and 10 girls in the 3 families. we also had another set of cousins on my moms side but I don’t remember a picture or a vacation with them. let me run home….. here is a bag of film canisters with 36 exposures on each of mountains rivers trees campfires friends met and companions captured on kodak film all returned in little boxes with double stacks of 3×3 cardboard wafers holding my summer in forever freeze frame suspension. I was disappointed that the breathtaking waterfalls in the rugged Montana and Wyoming backcountry came out as a little ribbon of water in the slides. learning 101 about how to frame a picture. I ended up buying the bulk film winder and doing my own developing for a short while but was never pleased. did some film making in the warehouse district of downtown Minneapolis with the bums sleeping in the doorways in the 60’s but the bug never bit me there either. I don’t know why it seems like it should have but it just never did. in my art circles photography was not valued although I was a huge ansel Adams fan. painting and pastels capturing the essence rather than the image. my art was a little schitzo then and still is today. what do you think that’s all about? good writing on these revisited guest blogs. well done baboons. thanks dale for archiving our words and thoughts better than I did my past. good stuff. Morning all – such a surprise to find something I sent in 5 years ago. I was terrified back then to do blog posts; I seem to have gotten over that! Young Adult and I were just talking about Fawn Doe Rosa this past weekend. We went apple-picking in Elko so had a nice drive down and back and we went from topic to topic. I think the State Fair led to bunnies which led to Fawn Doe Rosa! I realize I haven’t looked at these photos since the day this blog went up and now I’m wondering why in heck I’m barefoot? I mean, don’t get me wrong, barefoot is my favorite state, but walking through an animal farm with dirt, rocks and natural “by-products”? And mostly I’m thinking why in heck did my mom let me out of the car barefoot? Family mystery probably never to be solved. I’ve got this vs. You had red sneakers on in the first photo, so didn’t get out of the car barefoot. In photo two, you had removed your shoes after you were scared out of your wits, stepped into the pond and got your feet wet. You’re welcome. Oops, not you? Mystery remains unsolved. That’s my sister Sally with the red shoes. My mother would have been the one hollering about being made of money. Or being born in a barn, one of her favorites! I don’t mean to get persnickety, vs, but your “elk” is a fallow deer. Elk are a North American species and were once common in Minnesota. Fallow deer originated in Eurasia. Whatever it was, congratulations on making a buddy of this guy. You may be persnickety all you like! In the family folklore, it’s always been called in elk – we’re city folk, you know! And they don’t have this variety anymore at Fawn Doe Rosa either – at least not that we’ve seen the last 10+ years. Call it what you like. People have different names for deer-like critters. The “reindeer” of Santa Claus fame is actually a caribou. Europeans talk a lot about elk, but the animal is what we call moose in the US. And to switch to a different species, the US “buffalo” is a bison with no relation to the true buffalo species of Europe and Africa. In most contexts, using the “wrong” name has no consequence. Yes, and how the heck do you categorize prong horns? You get jack-a-lopes when you cross a big shot of bourbon with a bottle of Budweiser. Sometimes it takes five or six of ’em, but eventually you’ll get a jack-a-lope with a nice rack. Good morning. There probably are some family pictures stored away that my Dad took on family trips including some taken in Michigan’s upper peninsula. I especially remember a picture of my brother and I at an overlook facing a beautiful lake in the Porcupine Mountains park. I think this place, combined a few other similar spots, mark the start of my interest in the North woods and other natural areas. I remember that I particularly enjoyed walking along the woodland trails bordering the lake on the day that my Dad took that picture. Good point, Jim. A recent scientific study offered fresh proof of the value of children being allowed unstructured time exploring nature. My daughter almost weeps to remember the joy of her free play at our cabin. She wants this for her son but does not know how to make that possible. That’s a topic I cannot avoid in my fiction. Only a few of life o the farm, like the chain saw photos I put up recently. VS, I think you were probably in far more danger from the geese. They can be really mean. My parents were poor photographers. They would go for years without taking a picture. When they did pick up a camera they offered fresh evidence of how inept they were at it. But there is a photo of me taken when I was about 10. I am in a rowboat (a green Larson lapstrake). The boat bobs on the waters of Long Lake, a few miles east of Park Rapids. With my friend Bill Scheffler, I am fishing for bluegills, sunfish and perch with a fiberglass fly rod. That photo now triggers an overwhelming rush of memories, complete with sights, sounds and smells. What I could not possibly have known at the time the picture was taken was how those afternoon spent messing around with panfish would become one of the most cherished moments of my life. In the 1990s I made the mistake of visiting Long Lake again. My heart broke to find everything degraded from what it had been: the fish, the shoreline and even Long Lake itself. I spent my life with the comforting faith that I could always go back to that golden place. But it is gone, all gone. This was at Fox Lake, north of Grand Rapids, MN. It was a resort my parents went to with my grandparents and various other family members when I was very young. It’s almost too distant for me to remember clearly, but I associate it with the smell of a can of earthworms and the twang of a screen door spring and the slap-bang of it slamming. I think of it as the archetypal resort. Interestingly, I checked it out online and it appears to retain much of its original character, but photos can deceive. When I was 9 or 10, my parents bought lake property of their own. By then, my grandfather had died and we never returned to Fox Lake. Yes, there was apparently a brief period when I was adorable. No, BiM, your adorableness persists. I haven’t heard the word “fishing” used that way much lately but I was recently thinking that my mother used to accuse me of it often. What does it mean that she didn’t just give me the praise/support/love at which I was hinting? I don’t know, but it says more about her than about you. You are certainly praiseworthy (and adorable). Too funny, you guys. All baboons are adorable and a little fishy. 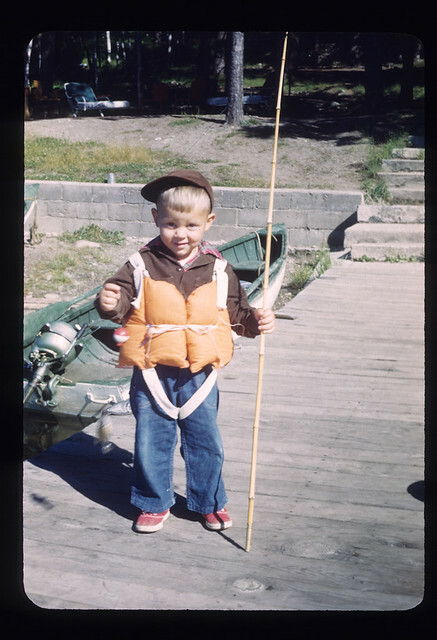 Nothing says summer in the 60’s like that orange life jacket. And nothing is more redolent of summer in the fifties than kapok. The summer before my freshman year in college, we took a family camping trip to Algonquin park in Ontario. After one meal, we found it amusing to put grapes in our noses and stuffed in our cheeks. The funniest pictures were when my father joined in to look ridiculous. This was not really a stretch because he was an actor with community theaters and was always the loud, funny center of attention wherever he went. Somewhere we have photos of my sister and me, petting a donkey at Knotts Berry Farm. At least I think it was a donkey. Could’ve been a burro or a mule. Sometimes it seems my daughter snaps a photo of Liam every hour or so. His life is documented in exquisite detail, like your grandson’s, Clyde. A radical change in photography is based on the good cameras now installed in some cell phones. The camera I gave my daughter is set to go to vs for her daughter because Molly only uses the camera in her phone these days. At any moment, that camera is within her reach. How different from my parents. If they wanted to take a picture, they might spend half an hour looking for the camera in some obscure drawer. Both of my children are dedicated photographers. My son wheels and deals cameras on Ebay. He is now doing some professional portraits. He has at the moment only very high quality three cameras plus his Iphone. My daughter has two cameras plus an Iphone, one camera is very high quality. They tell me I raised them to it, which I guess I did. And when you eventually did find the camera, did it have film in it???? Once when my parents hunted down the camera, not having used it in years, the film in it was so old all the pictures came out orange. Fun to revisit this, VS – have you been there this year? There is a home movie of me practicing in my long white dress to be Crown Bearer for Storm Lake’s Homecoming Queen, 1953 or 54. I had this green velvet pillow that I carried. More fun than that, though, is one of my sister practicing on the front sidewalk before being a Flower Girl in a wedding. She cast rose petals to the right and then the left, and afterward squatted down in her pretty dress to pick them all up and put them back in the basket. Oh yes, we visited in June. It was a beautiful day but not as many bunnies as Young Adult likes. August is best for all the wild baby bunnies that she stalks. We took a picnic lunch and after feeding several bags of food to the various animals, we fed ourselves out of the cooler! Oh dear… we can’t let YA know there is a Bunny Island in Japan!! 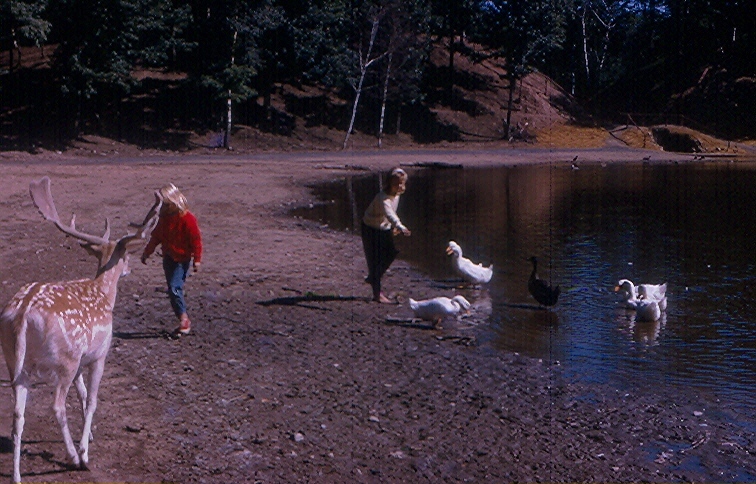 In 1960 my family visited family in upstate New York and we spent a day at Storytown – a Mother Goose themed park near Lake George (now called Great Escape and more like Six Flags). There are pics of me standing by Cinderella’s pumpkin and The Old Lady Who Lived in a Shoe. There was also an “Old West” section where my sisters and I were lassoed by a cowboy. In amongst those photos are ones of us feeding deer or goats – not sure if that was part of Storytown or some type of petting zoo in the vicinity. I have visited Fawn Doe Rosa once – maybe about 50 years ago! About 50 years ago is when this story took place. Maybe we were there at the same time!! There’s a Storybook Garden at the Wisconsin Dells that sounds a lot like Storytown. We’ve been there several times. But what about Reptile Gardens? Yes, Young Adult insists on reptiles as well. Spent a memorable afternoon at the Reptile Gardens a couple of years ago when we visited South Dakota and “the heads”. OT – I know I’ve spoken on the trail before about my sister and how aggressive she is. Randi has lots of wonderful qualities. One of them is, I think, that she always remembers birthdays etc. For husband’s birthday she had sent a package in plenty of time because the one she sent in April for me, arrived after the fact. Husband’s package arrived in plenty of time, and I wrote to tell her it had. I also told her I’d save it and give it to him on his birthday (yesterday). Today, when we arrived home from Perry, there was an email from dear sister. She wanted to know if I had remembered to give the package to husband as she had not yet received a thank you note from him. This to her was an indication, and she actually said this in her email, that either I had forgotten to give it to him, or he is slipping! Sheesh, happy birthday. Oh, dear. That has to be exhausting! Oh Jacque, after this many years of it, I just shake my head. It was always thus, and it will never change. One reason I’m glad an ocean separates us. In emails I can handle it; in person it tends to get a bit tense.